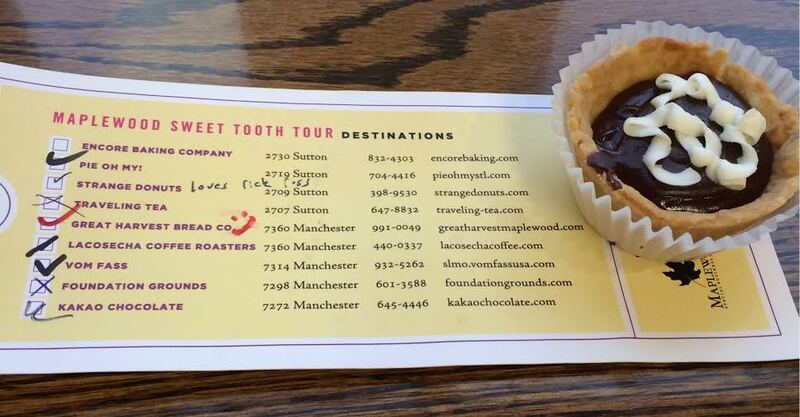 This past weekend I got to spend the day with my amazing friends walking the streets of Maplewood sampling sweet treats as part of the first ever Sweet Tooth tour. This self-guided tour took us to 9 different shops over a period of several hours. For $15, we were given a ticket to show at each shop and in return, we received a beverage or sweet treat. Stop one was a chocolate shop called Kakao Chocolate. 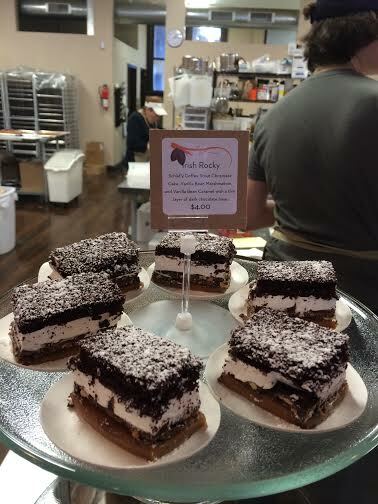 This shop offers delicious, all-natural sweets that are made right in front of you. Each person on the tour was served an Irish Rocky made with layered pecans, caramel, dark chocolate, vanilla bean marshmallow, and Schafly coffee stout chocolate cake. This was, hands down, my favorite treat of the day. 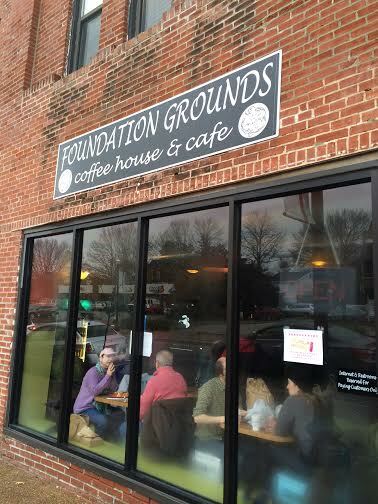 Next, we stopped by Foundation Grounds, a green, eco-friendly coffee house and cafe. This coffee shop had far more flair than your average chain store and we couldn’t stop talking about the paintings on the wall. We were served a no bake Goo Ball made with butter, oats, espresso, cocoa powder, and dried coconut. This rich dessert was a little much for me but I will definitely be back for brunch sometime soon. 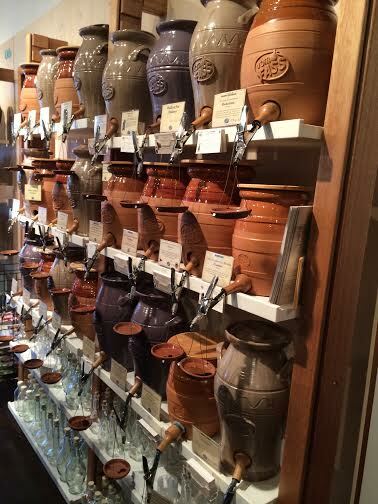 T he third stop was Vom Fass, a chain of stores specializing in specialty oils, vinegars, and spirits. Everything in the store is available to sample and I happily left with garlic oil and pumpkin seed oil. 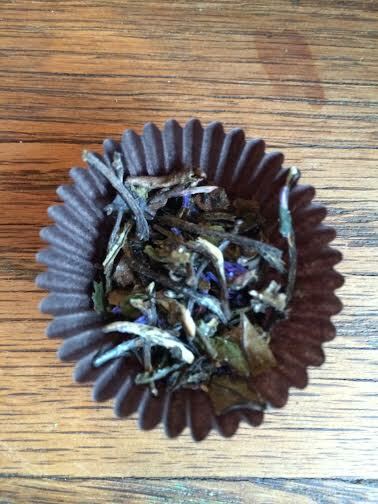 We were served our choice of sweet wine or an original liqueur creation along with an oil infused lemon cookie. Stops four and five shared one building. At the front of the store is La Cosecha, a fair trade coffee shop that roasts coffee to order. 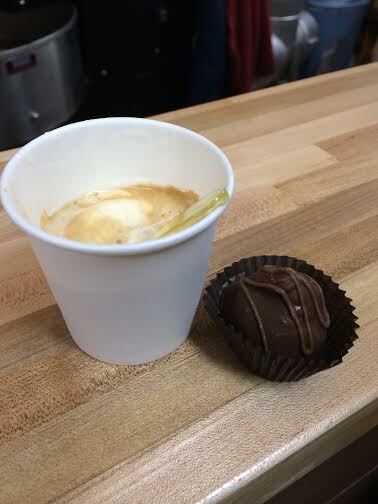 They were offering mini espresso floats with Serendipity ice cream and a Calley’s truffle. The second half of the store, occupied by Great Harvest Bread Co., served oatmeal cookies. They were also handing out samples of their delicious fresh bread. Number six was traveling Tea where we were served samples of Chai tea and candied tea leaves which I am still not sure I quite understand. However, the Chai was perfect for a cold, rainy day. Strange Donuts was stop seven. This was the only shop I had been to and I will have a separate post devoted to them. The eighth stop in our tour was Pie Oh My. We were served mini chocolate cream pies which, if I had not been to seven stops already, would have been a the perfect dessert. However, I had to surrender after one bite. 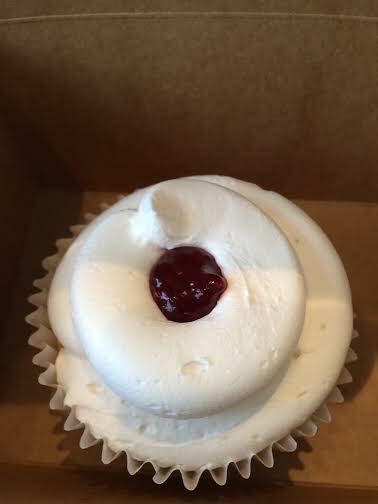 Finally we went to Encore baking company where we were given a raspberry-filled white almond cupcake. I enjoyed this cupcake at home and it was still perfectly fresh the next day. Although it was cold and raining, each of us had a great time and we all agreed that we got to see a side of Maplewood that we did not even know was there. Check out Maplewood’s website, http://www.cityofmaplewood.com, for links to all of the shops listed here and for a calendar of all of their upcoming foodie events!